clears up a lot of room in my closet! 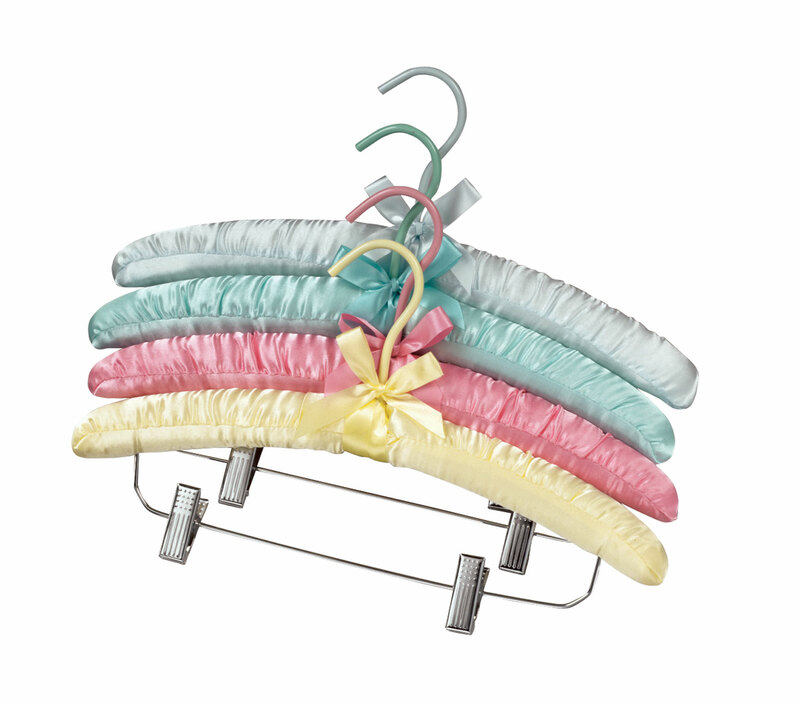 As pictured, the Space Saving Hangers hold five hangers of clothing each. The product is sturdy and doesn't crack or break like other products I've tried. Previously ordered hangers were so useful that I ordered even more!! Excellent for hanging sweaters, tees, blouses, etc. love hanging so much in so little space. I really like these hangers because they give me more space in the closet to hang other things. I moved from a ranch style house with very adequate closet space to a condo which is severely lacking in room. Even the "walk in" closet is little larger than a telephone booth!! Since all of my clothing came with me I had very little space for it. Now all of my shirts are on hangers hung from these hanger extenders thereby reducing the space needed by 80%. I've used them for years and wouldn't venture to try any other design. The price is extremely reasonable, too. I spend most of my weekends in my 28 foot camper and the closet space is limited but these Space Saving Hangers are so awesome for my limited closet space. I will be buying more sets in the future. Keep my closets neat and organized. Adds 4 x as much closet space. Have used these for years. Great for those with limited closet space. Easier to use than other similar products. The first time I ordered this product, I was expecting to receive a hanger that was flimsy, that they hooks would "snap" quickly.........boy was I wrong,,,,,,they are sturdy, of course quite easy to use and made the organization of my closet a breeze. Ordered two sets. Immediately put them to use and knew I needed to order more. So ordering 5 more sets! Great for our large under eave closets with little hanging room. Great to group like items such as husband's white shirts or my dressy blouses or my slacks. Everything much neater and more accessible. STURDY! I have had other hangers like these, but like your hangers so much better, they are heavy duty, and they stay better, because they are not lightweight. like some others I have. they saved me more space then a chest of drawers.. These are sturdy not flimsy like so many others, makes it easy to organize the closets. I took a chance on these based on other reviews and they're right--these hangers are terrific. They're sturdy and make it easy to organize my very limited closet space. I do find that thin blouses/shirts or other items work better on these than thick items like coats, but that's okay. I can hang five white shirts in the space of one. I'll be buying more of these and wouldn't hesitate to recommend them to others. I have ordered these in the past and love them. Hanging 5 articles of clothing on one of these hangers keeps the closet neat and the clothes wrinkle free. Was very pleased with the Space saving hanger! Its ready to be used & you don't have to hang other side of hanger to hang clothes & then take one side of hanger off!! Also its very sturdy! SAVES APACE IN MY SMALL CLOSET. STRONG. I have been looking for this product for a long time as I have been using some of the same for years. I ordered enough to last me for a while and to be able to hand all of my slacks and skirts in a small space. These are great for keeping outfits or colors together. I also use some for hanging necklaces in my closet. would NEVER use another kind. These last forever. Have recommended to many others. Small closet - need space? I live in a 79 year old house. There are only four very tiny closets since people a few decades ago did not have a lot of clothing to hang in a closet. These space saving hanger holders work really well in a small closet. I use them to hang shirts, blouses, some sweaters and jackets. 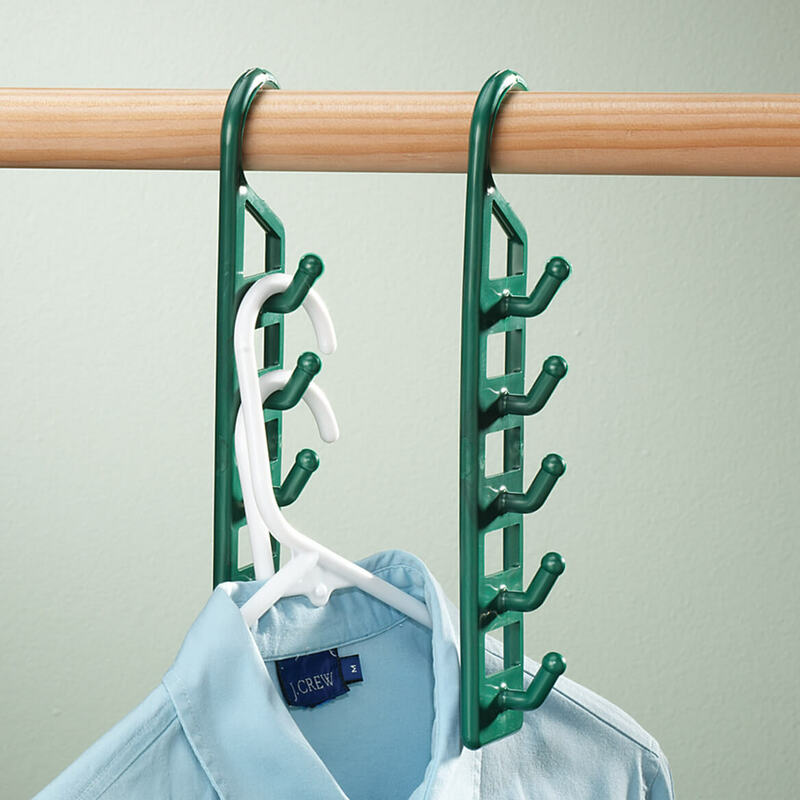 Each space saver hanger holds five garments. This means I can organize my clothing according to type and season without having a stuffed closet. The price of [$] per set of four works out to [$] per hanger and since each hanger stores five garments, this closet organizer is a bargain in my opinion. Love these. Sure help organizing my closet. As many people said, the hanger itself is not big enough to put on the closet rod. I don't quite know why people are saying this, when Miles Kimball has listed the size of this item and on everything else. I keep a measuring tape right by my Laptop so I know if it will fit or be the size I need. great for organizing the closet. I've been using these for years. They save lots of space and are sturdy. Just added four more to my closet. Hang just about anything on them and saves lots of space. These hangers are very sturdy, unlike others that I have bought. This product add alot of space to my closet. Love it ! I was hesitant to purchase these because I wasn't sure if they worked. They do! I use them in my daughters closet with her shorts because we hang everything (do dresser). This frees up a lot of space and the quality of the plastic was actually really nice too. It doesn't feel like it will break. My recommendation is to put the items you don't wear often on the bottom hooks and work your way up with the items you use more often. I'm definitely purchasing more of these. Love these hangers. I have a closet full of them. They hold a minimum of five garments per hanger and for lighter garments, I can double up. Great for hanging blouses/tops. Easy enough to use during the season, not just for off season storage. These survived the movers, when other type of hanger organizer did not. Helps keep closet, Neat!! Wonderful item. Love it!! 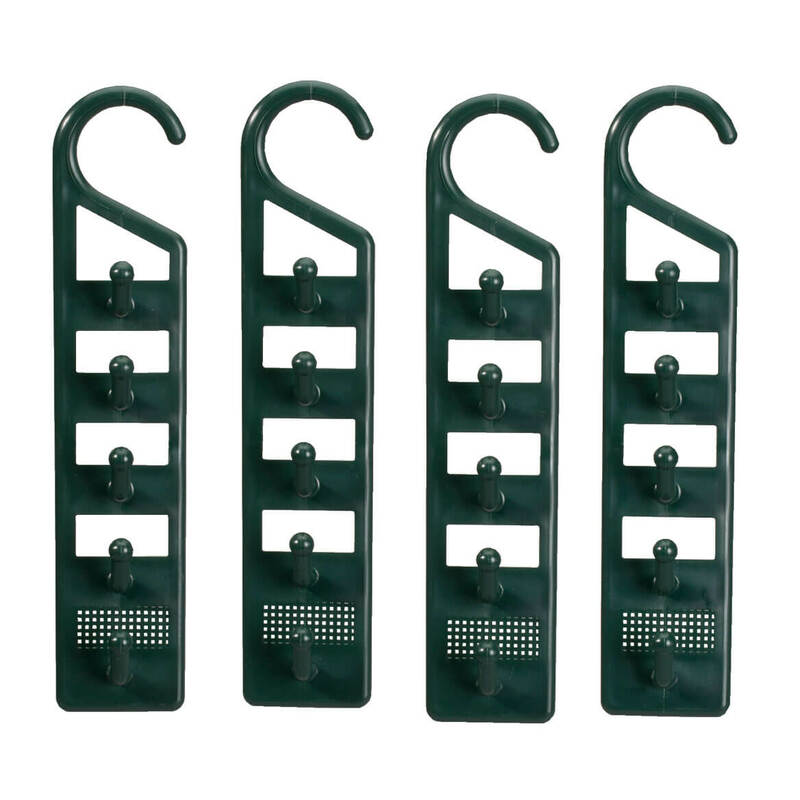 In addition to using these to save closet space when hanging skirts and blouses, I use them to hang my handbags and hats. I'm able to save a lot of space in my bedroom. Not only saves space, but can keep groups of similar or "go with" things together! I really like these and I wish I'd gotten more of them. I have a small closet, and was offered an extra armoire, but could fit everything in the small closet, giving "more space" in the bedroom. I would like them more if one could choose colors instead of all black. A hook on the bottom would make them more practical: One could hang the spacer on both hooks when putting the clothing on the spacer, and then release the bottom hook when the clothing is hung. These have made my day! It made it easier for me to reach my cflothing because I am rather short and needed my husband to reach my hanging clothes in closet. Now I can hang them up and take them done without assistance! I love the idea of these. They seemed like a great way to save space in my closet while still getting to use my preferred plastic tubular hangers. My problem with them is that my closet bars have a wide diameter and the hooks are too small. My husband was able to heat one and spread the hook enough to fit but this is the first time I've ever experienced this problem. I love these they work great in a full closet. I already have some. I love these in my closet. Makes it a bit more organized. Will be able to fit more items in my closet. Have several sets and would like a few more. 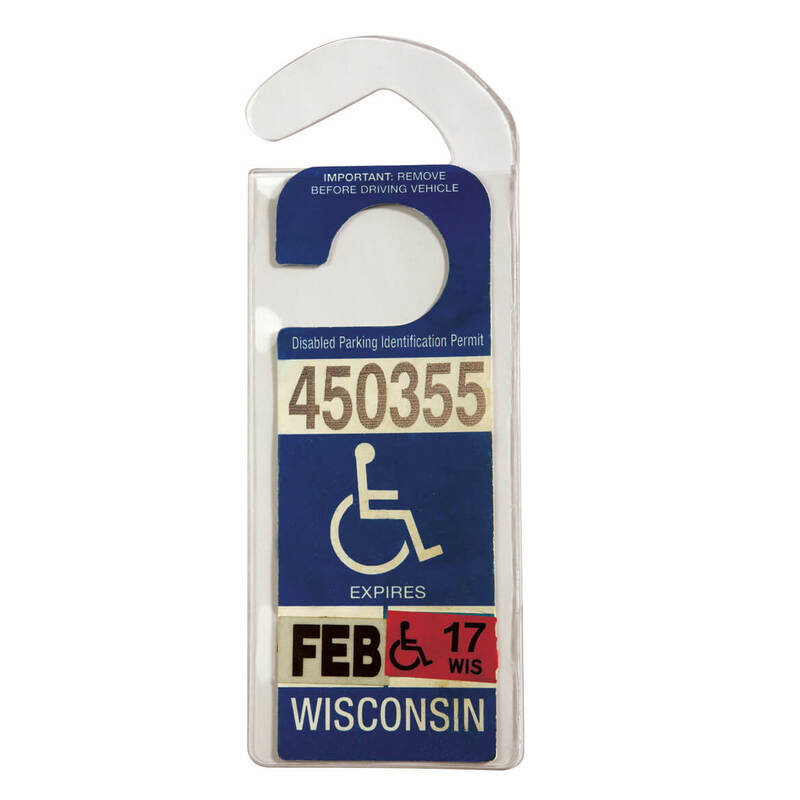 They're much easier to use than the type you have to insert the hanger through the loop type. Closest I could find to black circular that folds down. My older home has very stingy closets. I've been looking for this organizing solution for years! To organize my tops and blazers. I need to make space in my closet, and I think these will help. I can hang many items in the place of several hangers. To try them -- see if it makes it better soacung in the closet. Because I never have enough closet space! The hanger holders provide more space in my closet and prevent wrinkling. I highly recommend them. I never have enough room in my closets. This helps with more space. They are sturdy and so easy to use. Any size hangers fit the hooks. We already have some of these and really like them; they "hold up" better than some of the other styles we've tried. Previously ordered a set of these and they are great. Very sturdy and save closet space. Ordered another set. Small closet I think that this product will free up some space. 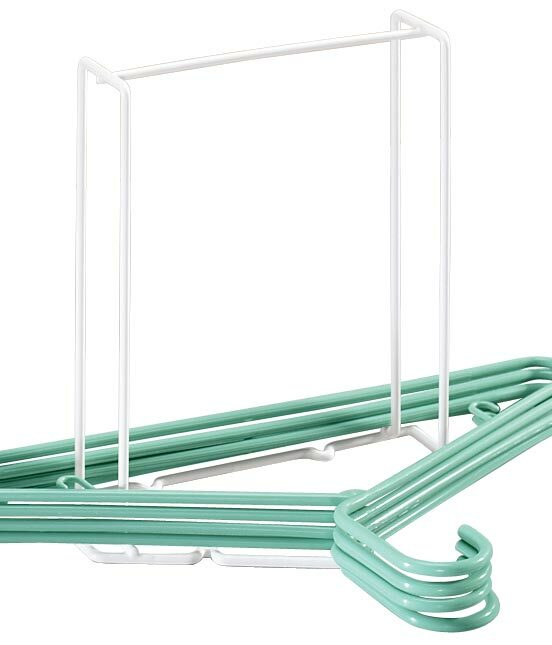 I have used several types of multi hangers and found these to be the easiest to move the clothes hangers off and on. They are sturdy, too. Love them. Organizing my closet and these looked easier to use than what I had been looking at which was the cascading hanger hooks. I chose to purchase from Miles Kimball because the price was better. for more space in an apartment with only one rather large closet. It gives me more room for more clothes in the closet. I bought a set earlier and I liked them. So decided to order 2 more sets. Use them now. They are greatr! I love these it saves so much space in the closet.